Ratbehavior.org is the premiere website on the behavior and biology of the Norway Rat, which means your pet rat! There are hundreds of pages on this subject, very scientific and always a fascinating read. Below are a few index pages on rat behaviors. Click any image and go directly to the site and read, read, read. Must must must. This first one is http://www.ratbehavior.org/rats.html. 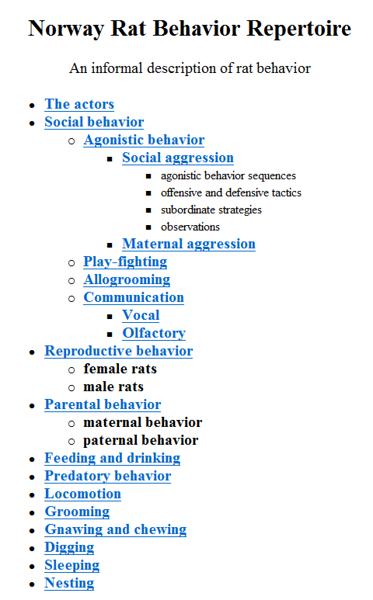 Next, the entire Norway Rat Behavior Repertoire index shows you the many behavior topics you can visit. Click the image and become familiar with all your pet rat's behaviors. This is the direct link: http://www.ratbehavior.org/norway_rat_ethogram.htm. Next, the detailed page on Norway Rat Social Behavior gets into the details. This image is just the beginning - click it and and become familiar with all your pet rat's behaviors. 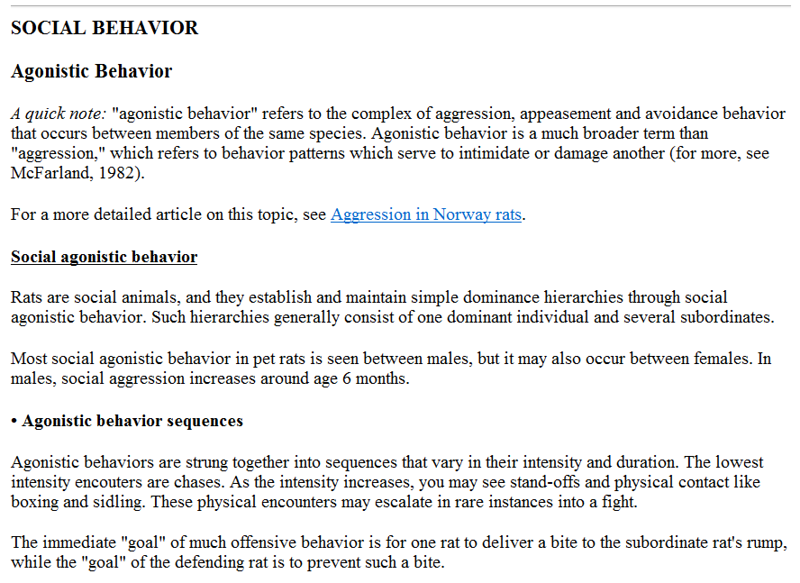 This is the direct link: http://www.ratbehavior.org/norway_rat_ethogram.htm#SocialBehavior. 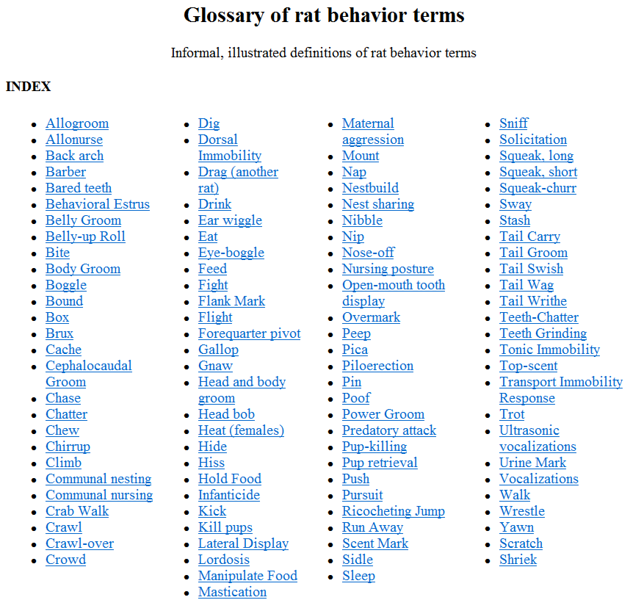 Finally, here is the fantastic Ratbehavior.org Glossary with a huge number of terms and links. 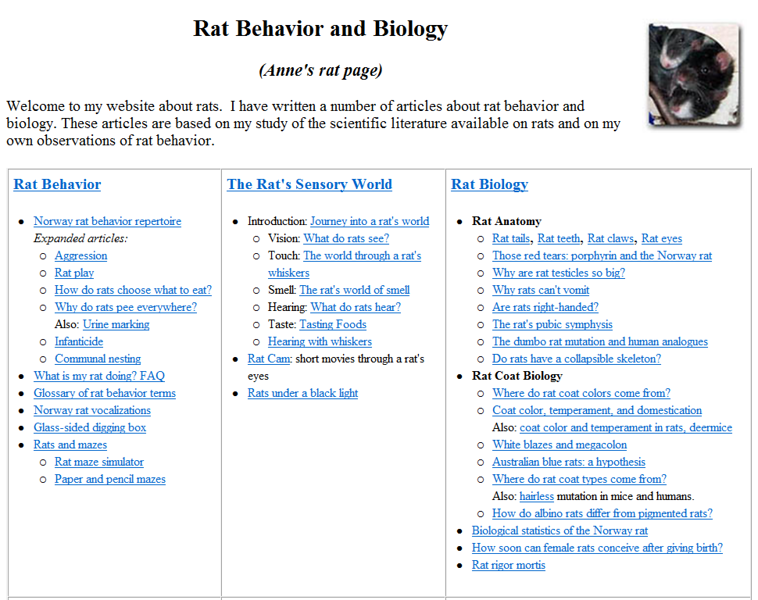 If you roam the Glossary and want to return to the framed page directly, here is the direct link: http://www.ratbehavior.org/Glossary.htm. Some of the best scientific definitions of rat behaviors, from Ratbehavior.org. If you are viewing this on the keywords page, click the "gallery" link below this and visit the framed page on Ratbehavior.org and study all about the Norway Rat's behaviors - especially the pages on aggression, social interactions, and play fighting. Then there are the million pages on the physiology of Norway Rats, you will learn critical, useful information about your pet rat. Okay, go on now. Did you go? Scoot scoot! Your rats will love you for it.